Enter the Congressional Art Competition for the 33rd District and Win a Scholarship Prize and Trip to DC! The Congressional Art Competition is open to all high school students (9-12th grade) who either reside or attend school in the 33rd District. All student participants will receive a participation prize. 1st, 2nd, and 3rd place winners will also receive a scholarship. Additionally, 1st place will be displayed for one year in the U.S. Capitol as part of a larger exhibit and receive a trip to Washington D.C. to be recognized at an annual awards ceremony in June, 2nd place will be displayed for one year in the Member's Washington office, and 3rd place will be displayed in the Member's District office for one year. The exhibit in Washington will include the winning artwork from all participating districts from around the country. The winning artwork is also featured on House.gov's Congressional Art Competition page. We are NOW accepting submissions for the Congressional Art Competition! The SUBMISSION & RSVP DEADLINE is Friday, April 6, 2018, at 5:00 PM. The reception will take place at the Wallis Annenberg Center for the Performing Arts on Saturday, April 28, 2018, from 1:00-3:00 PM. Please see below for additional details. 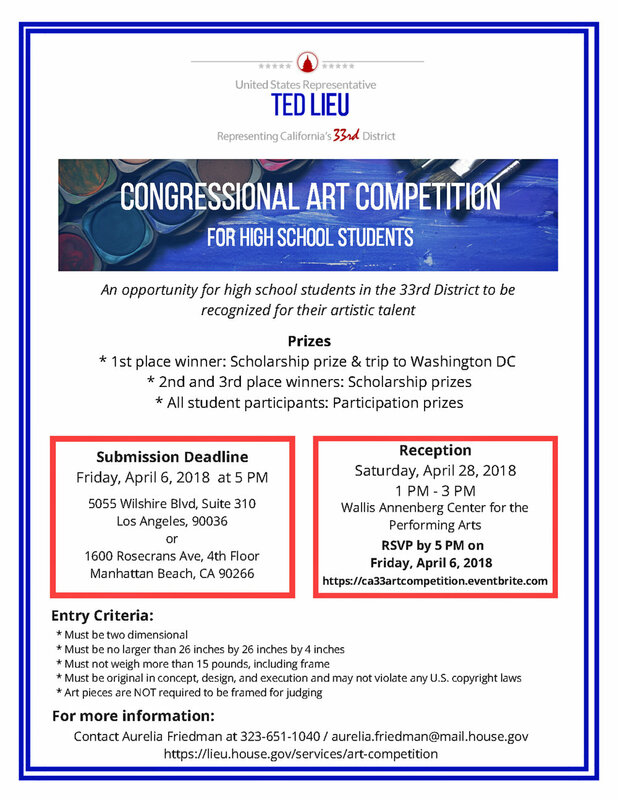 If you would like more information on the Congressional Art Competition, please contact Aurelia Friedman at Aurelia.Friedman@mail.house.gov or (323) 651-1040. What is the 33rd District? Here's a digital map link as well.